talkhealth > Blog > 2013/11 > Ready...teddy...chaos! I’m happy to report that during my short break from writing on here Rosie has remained on top form. She’s had us in fits of laughter, surprised us with some new achievements and pulled on the old heart strings with acts of ridiculous cuteness. 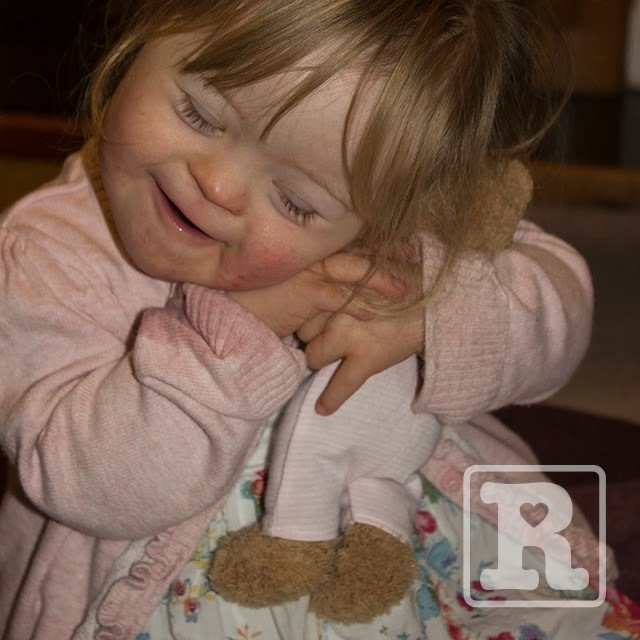 Recently one of Harry’s football team mates, Ben, kindly bought a new teddy for Rosie and it’s quickly become her favourite cuddly toy. 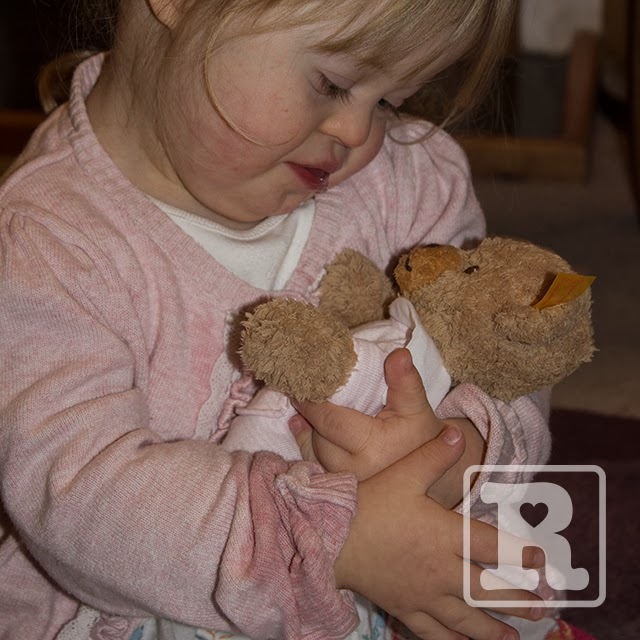 The moment she received the bear she was smiling, chatting to and hugging it. It’s never far from her side and she seems to enjoying mothering him. Just the other day Karen was in the kitchen getting Rosie’s lunch ready when she noticed everything had gone quiet in the living room. 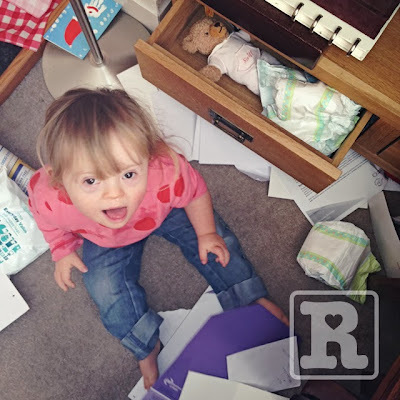 Rosie usually follows Karen when she’s busy, bum shuffling after her in a determined manner, shouting until she has mummy’s undivided attention – so the silence was all the more suspicious. 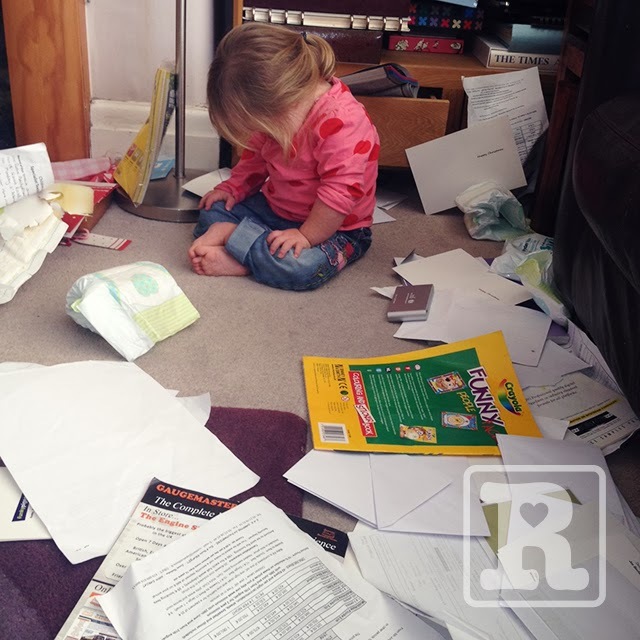 Karen went to investigate and discovered Rosie emptying the entire contents of our ‘cram everything into’ draw all over the living room floor – all to make a special home for her new teddy, which she carefully laid down and ‘tucked in’ with a (clean!) nappy for a blanket. 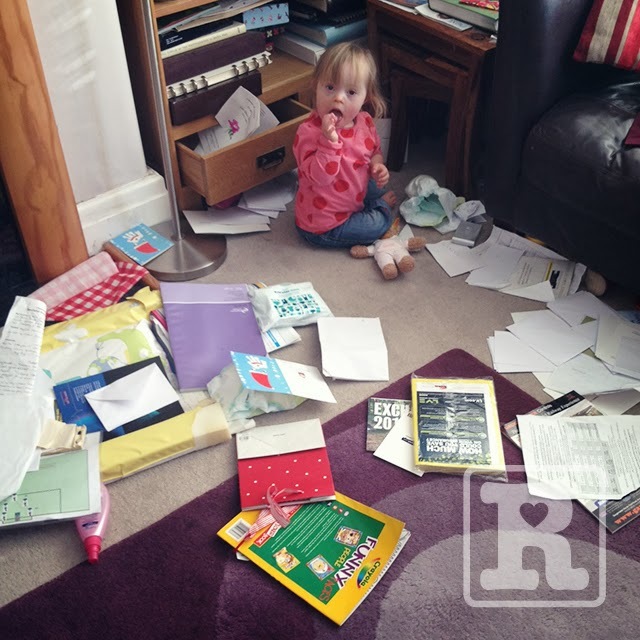 The pics below show the ‘chaos’ along with her reaction at being caught in the act. The hanging head in pretend shame being a particular favourite. 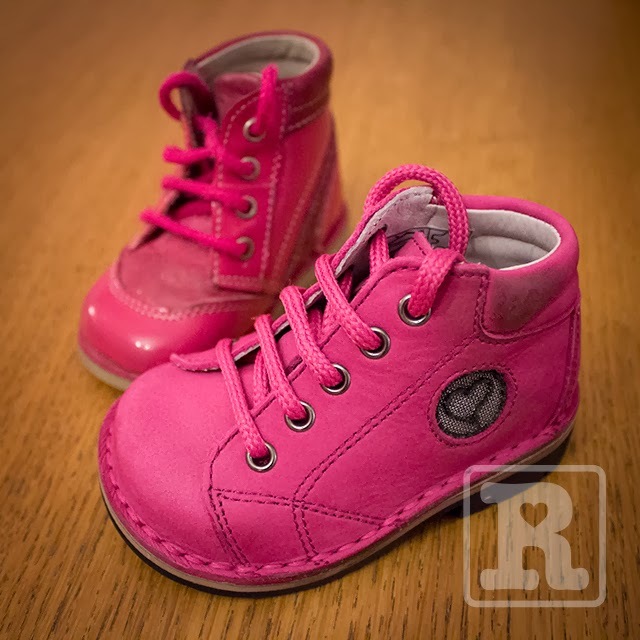 This week has also seen the arrival of Bud’s new boots. She’s finally out grown the previous pair, not that we didn’t like them but they are so small and it’s taken her an age to out-grow them. The new ones look huge on her but we’re hoping the wider base on the sole will offer more stability and encourage her to stand up for longer. She’s still very hit and miss with leg strength – one minute she gives us the impression she wants to try and master standing and the next minute she just plonks herself down on her bum showing no interest again for a few days (even with our constant encouragement). We shall keep persevering but we are quickly learning that Rosie does things when Rosie is ready and not a moment before.